I don’t know how it happened, but I’ve been surrounded by four-letter words my entire life. And then swearing just kind of became something we all did. Now that I have a family of my own, a family who shares how we feel, it seems that we also express ourselves with four-letter words. Except it seems that lately our daughter has been expressing her feelings a lot more vibrantly than her brothers have been. Or maybe she’s just been caught by Dad more often. To be clear, all three of my teenagers are respectful to adults and children, get good grades, do not drink or do drugs, are kind, have volunteered and are well-liked in our community. So, it appears that my daughter drops the F-bomb when she gets angry. Is that all that bad? The other morning, she was crabby. Heck, she’s almost 16. She’s had a really rough year, she’s overcome an eating disorder, depression and anxiety, she’s recently been bullied at school and she’s struggling with a lot of other regular teen stuff. She was running late for school and she dropped the F-bomb. It went right over my head, but not her dad’s, and he kind of flipped. If you know my daughter and her temperament, you don’t flip on her when she’s already in a mood. If you know any teenage girl when she’s tired, running late for school and crabby, well, dads, take a freaking lesson already, am-I-right? My daughter’s explanation is that swearing is her way of expressing her anger, and would we rather have her in her room cutting herself? God no! Say the F-word as loud and as angrily as you need to. Get that anger out. As long as she’s not telling someone to f*** off, and as long as she’s not using the word in a cruel and destructive manner, I’m totally OK with it. She’s not swearing in a public venue, she’s not swearing at her teachers, at the parents she babysits for, at any authority figures or in front of children. She’s using it as a coping tool to express her anger, rather than using another tool, like a razor or knife, to instill physical harm on herself, which she explicitly told us was the other option. 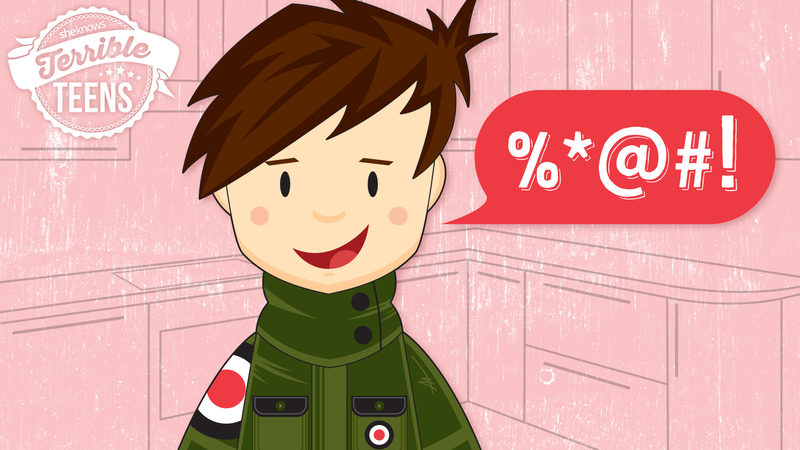 How do you feel about teens and swearing? Do you think I’m crazy to let my daughter, and my other kids for that matter, use this as a tool to show their anger as long as they’re not being cruel or hurtful to others?